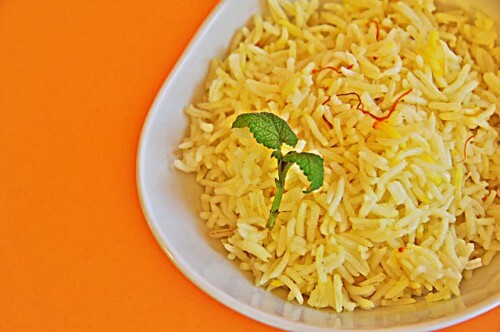 A great rice recipe when plain basmati rice just won’t do. The saffon adds such a lovely, bright golden color to the rice, in contrast with the crimson saffron threads dispersed throughout. 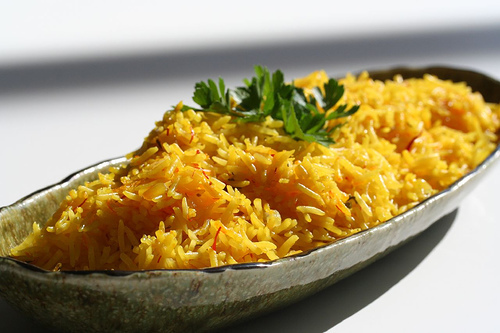 Saffron rice has a delicate, floral aroma that you can’t duplicate with any other spice. There are 3 secrets making this rice. Secret No.1: Use good quality saffron. Don’t buy the cheap stuff. Everyone says that saffron is the world’s most expensive spice – true if you are counting ounce per ounce. But you use so little of it each time. 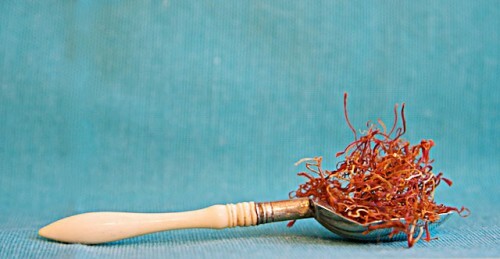 Here’s the key to buying saffron. The threads should be almost all bright red. If you see yellow, that means when the threads were harvested, they picked the flower portion. Another note on using saffron – you should soak the threads in a little bit of hot water to really open up the spice and release its flavor. Use the threads plus soaking water in your dish. Secret No.2: Fry onions before steaming the rice. It gives rice an earthy, caramelized onion flavor. You can substitute minced shallots for the onions. Secret No.3: Salt. Everything tastes better with salt. This rice comes alive when you add something salty to it. In this recipe, I used broth instead of water to steam the rice. In a heatproof glass bowl, combine the saffron or turmeric and chicken/vegetable stock. Mix well. Heat the stock mixture in a microwave oven (on high for 30 seconds) or in a saucepan. Stir and set aside. Wash the rice with cold water. Repeat 2 or 3 times. Drain well. Place the rice, salt and butter in the inner cooking pan of the rice cooker. Add the stock mixture and stir. Place the inner cooking pan in the main body of the rice cooker, close the lid, plug in the unit and press the switch to start cooking. The rice cooker will turn off automatically when the rice is ready. When cooking completes, allow the rice to “rest” for 15 minutes before opening the cooker. Open the lid, stir with the nonstick rice spatula and serve.